What Does 2017 Hold in Store for Swiss Industries? The new Sector Handbook from Credit Suisse explains the outlook for the most important sectors. By the end of 2016, the Swiss economy had largely overcome the franc shock of early 2015. However, the recovery has yet to fully reach every sector. The export industry was cut in half in 2016. On one hand, the pharmaceutical, chemical, and medical technology industries grew dynamically. On the other, exports from the mechanical, electrical, and metal industries (MEM industry) continued to decline slightly. The year was especially bad for the watch industry. With a fall in exports of more than 10 percent, the sector experienced its most difficult year since the 2009 crisis. In 2016, differences appeared not only between industries, but also between SMEs and large companies. 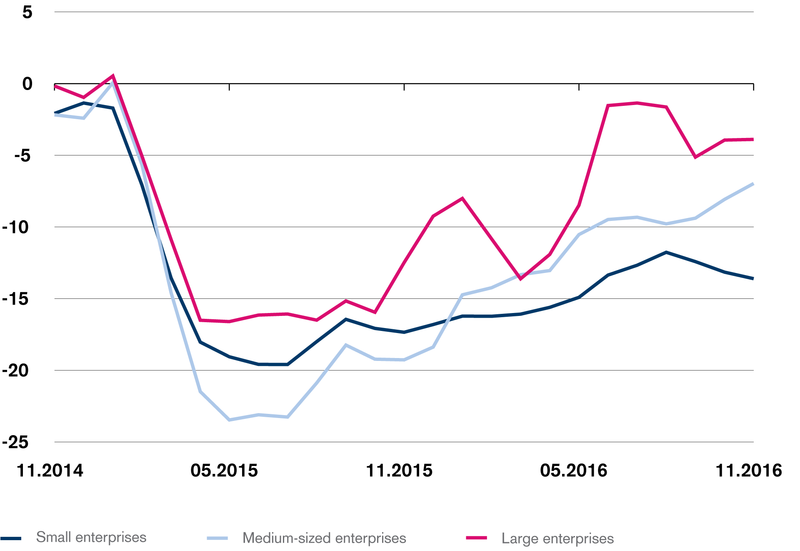 While larger industrial firms were able to endure the franc shock for the most part, many smaller industrial SMEs continue to suffer from reduced price competitiveness and depressed margins. 2017 is likely to see the gaps between export industries continue to close, although not completely. Among other things, it should be expected that exports from the MEM industry will climb again slightly in 2017 after declining in the last two years, particularly those in the machinery sector. The main drivers of this recovery are the solid economic conditions in export markets and the stabilization of the Swiss franc's exchange rate. The more domestically oriented metal industry is likely to benefit from the stabilization of the construction industry, while facing continued high price and import pressure. The positive momentum will likely be transferred to smaller SMEs in the MEM industry in 2017, even though many of them will continue to feel the burden of the strong franc more heavily than large, internationally diversified companies. On the other hand, the Economic Research unit at Credit Suisse does not expect the watch sector to grow again in the current year. Various factors that weighed on the watch industry in 2016 are likely to persist in 2017 – particularly the uncertainties concerning the further development of tourism in Europe in the wake of terrorist attacks. In contrast, the chemical/pharmaceutical and medical technology industries are likely to continue to benefit from robust global demand for healthcare products and contribute to Swiss exports substantially. Stabilization is also expected for the partially foreign-oriented hotel industry. The number of overnight stays may even increase slightly, depending on circumstances. In the domestically oriented retail trade, a gradual stabilization of sales should be expected in 2017. Compared with the declines in the two previous years, this comes as a relief. Shopping tourism is unlikely to increase further. In contrast, however, more goods will be ordered over the internet, which will put additional pressure on brick-and-mortar stores. In addition, private consumption stands to grow only a modest amount due to lower population growth, stagnating purchasing power, and below-average consumer sentiment. Slowing population growth is also serving to curb demand for residential space, which is increasing risks in the medium term for the construction and real estate sectors, as well as for construction-related areas like architecture firms. According to forecasts by Credit Suisse, however, sales in the construction sector will remain high in 2017, since heavy investment in real estate can be expected in light of the low interest rate environment. As a consequence of this, the finishing and engineering trades are also likely to recover after weak performance in 2016. Corporate service providers, such as attorneys and consultants, are likely to continue to benefit from increased regulatory and compliance requirements in 2017, especially in the finance industry; IT service providers stand to profit from advancing digitalization. Credit Suisse also expects that the government-related healthcare, social services, and education sectors will continue to grow in 2017 due to the prevailing demographic drivers. However, the momentum is likely to fall below the long-term average again. These will be slowed by the strained public finances in various cantons and the associated austerity measures. In other domestically oriented sectors (such as the food industry, telecom sector, and the printing and publishing sector), strong growth is hindered by the sluggish development of private consumption. Is active What Does 2017 Hold in Store for Swiss Industries?